The Windrush Justice Fund was launched by Patrick Vernon OBE in mid April 2018 during the height of the Windrush Scandal linked to the wider campaign for Windrush amnesty petition to the government which over 180k people signed. • Focus and target to organisations/networks around the country that are currently or established doing additional free legal advice sessions for Windrush Generation and other Commonwealth citizens. Over £11K has been raised on the platform plus 5K separate donations. The target is to raise 20k by the end of September. We have been approached by several organisations that are doing additional fundraising on our behalf of the fund and thus we now decided to extend the end of fundraising to the end of November 2018. Please see Patrick's latest radio show where he interviews some victims of the Windrush scandal. The Windrush Generation were invited to Britain from Commonwealth countries. Now the children they brought with them are now being told they are here illegally. but many have got in touch saying they need help now. The government appears to be in a state of confusion of what's happening - leaving people in fear for their future in the UK. That’s why we urgently need a dedicated hotline staffed by experts who can immediately start helping people who might be affected - and help for legal services they may need. I’m launching this fund with the Joint Council for the Welfare of Immigrants, Runnymede Trust and the Black Cultural Archives to help those affected by this cruel injustice. The first £15,000 raised will fund legal assistance, including a helpline by the JCWI for those affected by these rules. The Home Office has set up a helpline which may provide useful information, but everyone caught up in the immigration system needs independent, impartial advice from legal professionals whose duties are to them, not to the Home Secretary or the Government of the day. Since the Government removed legal aid from most immigration cases, the best way we can make sure people who can't afford to pay get that advice is if you can donate to help lawyers and charities provide it. I’m talking about people like Albert Thompson, who was refused NHS treatment for his cancer. People like Paulette Wilson who was taken to Yarls Wood and nearly forced onto a plane to Jamaica despite having lived in the UK since 1968. Or people like Elwaldo Romeo, who lived in Britain for nearly 60 years before being told he was here illegally by the Home Office. He moved to the UK from Antigua when he was four years old. Now he has been told to report to the government every two weeks. 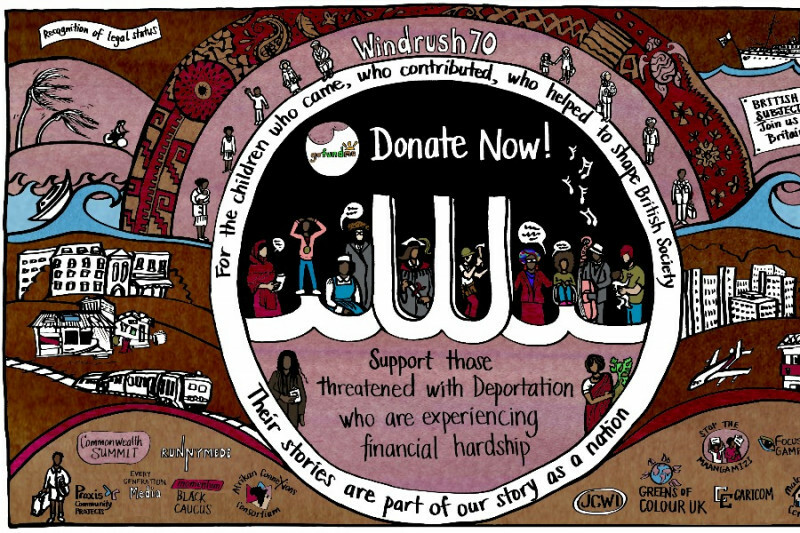 Please give as much as you can, and share this fund to stop the injustice being done to the Windrush Generation. The Mayor of London, Sadiq Khan, has described the Windrush scandal as a ‘stain on our nation’s conscience’, as he announced plans to provide £20,000 to help members of the Windrush generation gain access to support services. Last year the government said at least 63 members of the Windrush generation could have been wrongly deported from the country after being asked to prove their legal status to remain in the U.K. The money will be hosted by the Joint Council for the Welfare of Immigrants. It will be distributed by an Advisory Board which will include a representative of the Mayor. The process for applying to the Fund will be published in the coming weeks.